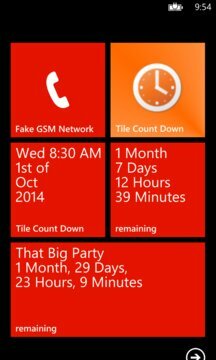 Tile Count Down allows you to create live tiles on your home screen that count down to all your big events. Set the date and time, set it to alarm on the date and set your own tile background picture. Its your event so create it how you want it! Best of all, this app does not require any internet access and is completely free. 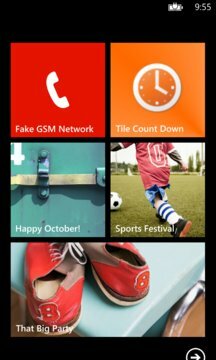 Ensure that background tasks are enabled and please note that Windows Phone OS only allows tiles to be updated once every 30 minutes. Battery saving mode may stop the tiles from being updated when battery charge is low.